Students held a debate in the Wilson Library Wednesday afternoon on the importance of libraries within communities. Freshman political science major Mason Stackman and junior English major Christian Nunez were teammates in favor of the preservation of physical libraries. 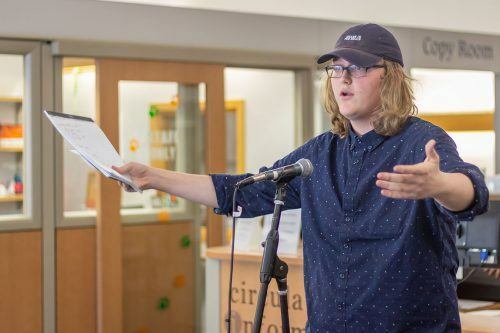 The opposing team, freshmen political science major Colin Coppock and philosophy major Noor Tabba, argued in favor of internet-based libraries and the movement toward a technological society rather than staying dependent on physical books. Stackman said libraries are a communal and civic environment, where books are at the forefront of the discussion but they establish much more than that and are an opportunity to uplift yourself. Nunez shared testimony of his grandfather who, after emigrating to the United States, was able to learn English from reading books at a local library. In opposition, Coppock posed the question of the kind of education we acquire with libraries, adding that the internet has gathered more information, allowing more accessibility and mobility than any library ever could. Coppock said that with access to internet, individuals are able to gain a more critical lens on society and that in 2016, 44% of Americans said they went to the library. Audience members were able to pose questions and comments throughout the debate, making the discussion much more interactive. “The idea of accessibility is simply not being approached through the concept of having only internet primarily in this public space,” said Abigail Humphrey, sophomore English major. Tabba agreed that people learn in different ways, but that jobs and employers are moving toward requiring computer literacy; proving the need for individuals to keep up with the status quo. Junior political philosophy major Kacee Jones commended the debaters for holding the discussion in the first place, sharing that she practically lives in the Wilson Library and could not imagine being without it.